The colors in these monotype papers remind me of textured rock formations found in canyons of the Southwest. 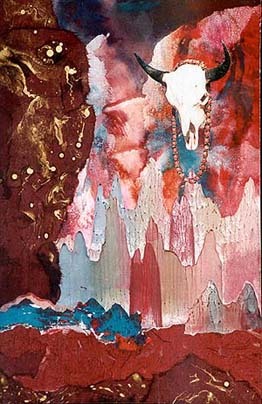 The cow skull is a photograph I took at Jackalope in Santa Fe, New Mexico. Love the beads! Paper collage techniques are very simple. Soft gel works best here, because it doesn't make the papers wrinkle so much. I applied the cut-and-torn decorative and monotype papers in layers, rolling them flat with a soft brayer.